Vladimir Ilyich Ulyanov, later known as Lenin, was born on April 20, 1870 into a middle class family. 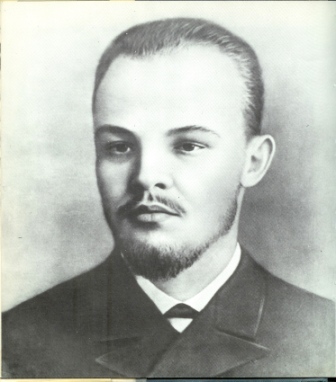 Lenin's father died in 1884. Two years later, Alexander Ulyanov, Lenin's brother, joined an illegal opposition group. This group had intentions of assassinating the Czar in order to initiate change. Alexander was caught, and sentenced to death on May 8, 1887, hung in St. Petersburg. Lenin was strongly affected by this tragedy. Because of his brother's death, which prevented him from going to school in St. Petersburg, Lenin attended Kazan University, only 87 miles from his home. He was kicked out after only three months because of taking part in "demonstations against authorities". After Lenin's expulsion, his family moved temporarily to Kokushkino, a country estate owned by his mother's family. While Lenin was there he read works of many influential Europeans philosophers, including Karl Marx. When he was allowed to return to Kazan in 1888, he reunited with his "politically involved friends" with intentions of resuming studies at Kazan University or abroad. His family moved again shortly after to the Samara region in 1889 because his mother thought they would be better off there. He studied at St. Petersburg University as an external student where he carried out his studies from home. He completed the four year course in less than one and passed the exams effortlessly. Vladimir was obviously more focused on politics than law. He became dedicated to overthrowing the Czar using the socialist theories of Karl Marx, just like his brother. In time, he would succeed.